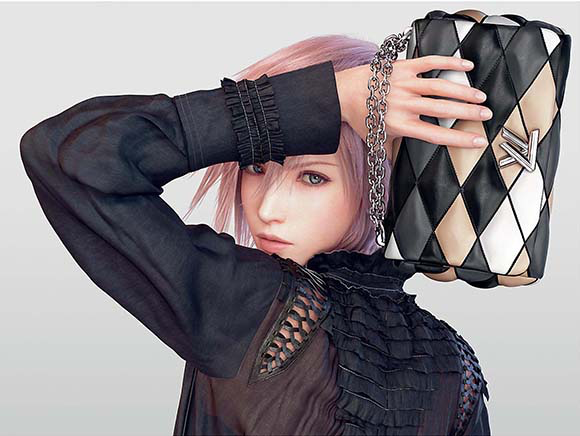 Louis Vuitton uses Final Fantasy character as model in new ads #gaming #fashion « Adafruit Industries – Makers, hackers, artists, designers and engineers! 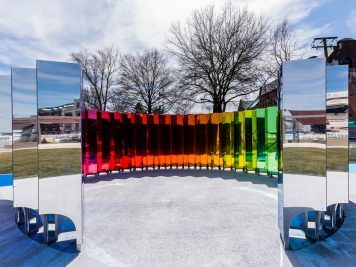 It’s a case of art imitating life imitating art. Luxury fashion house Louis Vuitton’s latest celebrity model isn’t, strictly speaking, a real person: She’s a computer-generated video game character from the popular Final Fantasy series. Vuitton’s current digital “it girl” is Lightning, a warrior who has traded in her gunblade for designer merchandise—at least temporarily. On the ad pages of a recent Vanity Fair, Lightning can be seen sporting her trademark pink hair and brandishing a metallic leather handbag. The clothes and purse look ordinary, but her skin is smoother than that of even the most excruciatingly photoshopped human woman. Lightning dwells in the uncanny valley; she is real enough to pass as a model, but her dead eyes and perfectly regular features create a subtle sense of unease.